Books remaining: 20. Weeks remaining to read them: 40 (argh! Get a move on, lassie. Actually, I blame Umberto Eco). Oskar’s Dad, Thomas, died in one of the Twin Towers on 9/11. Nearly two years later, Oskar, his mum and his grandma are trying to work out how to live without Thomas. Oskar finds that his dad left behind a mystery. And he decides he must solve it, no matter how long that might take. From a giant, lovely tangle of words emerges the inner world of Oskar, one of the best-rendered children I have come across in a work of literature. I’m reminded of Arundhati Roy’s classic The God of Small Things, Michael Cunningham’s Flesh and Blood and, more recently, Emma Donoghue’s Room. 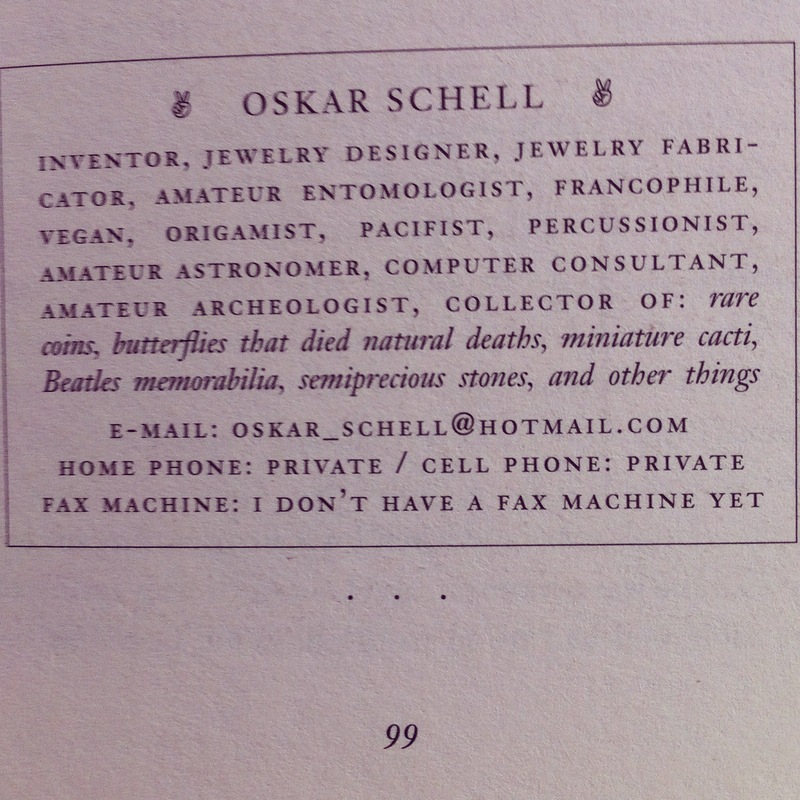 But Oskar is very much his own self, and is quite capable of standing alone, as his business card attests. Oskar meets many people on his quest, which takes him across the whole of New York. He sees and hears the private stories of these people’s own losses, obsessions and inexplicable commitments. My boots were so heavy I was glad there was a column underneath us. How could such a lonely person have been living so close to me my whole life? If I had known, I would have gone up to keep him company. Or I would have made some jewelry for him. Or told him hilarious jokes. Or given him a private tambourine concert. It made me start to wonder whether there were other people so lonely so close. I thought about “Eleanor Rigby”. It’s true, where do they all come from? And where do they all belong? Safran uses special effects: illustration, some inventive punctuation and conversational styles, and other visual devices that rather defy description. But none of it feels contrived, pretentious or pointless. It feels like I am getting a closer look into Oskar’s world and the way he processes information. And the way he processes loss. Because above all, this is a story about grief – grief, and the guilt that slinks in alongside it. It is about the people left behind, trying to make a new space for loves that will last forever, but that have changed into something invisible. It is about how we try to hold on and how we have to let go. This book is 341 pages long. By 305 I was weeping like a baby. I kept it up until the last page, and then for a few more minutes after that. Any book that makes that happen, and still not get called depressing, is special. This book is a heady jumble of ideas, it is funny and illuminating. It charms and puzzles and delights. I felt as though it understood me and helped me understand myself. It will make your eyes hot and your throat tight. It will remind you of everyone you ever lost. But it’s worth it. Keep or not? I’ll keep it for the moment, but only so that I can give it to someone who is interested. Postscript: The Ministry and I tried to watch the film of this a year or two ago. We found it disappointingly mediocre and turned it off after half an hour. I might have another burl at it now, though, not because I think I’ll like it better, but it’s fun watching stories you’ve read come to life, even if they don’t do it the way you wanted. 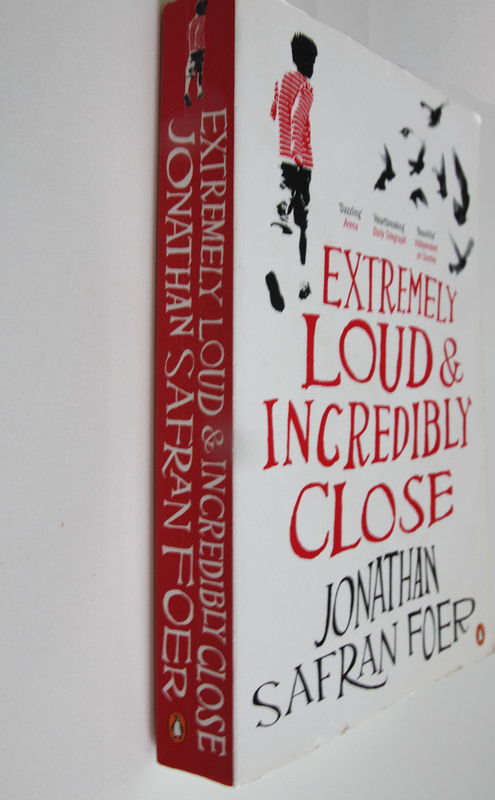 This entry was posted in Books, Fiction, The Curing of a Bibliomaniac and tagged 2005, 9/11, Arundhati Roy, Emma Donoghue, Extremely Loud & Incredibly Close, Film, Flesh and Blood, Jonathan Safran Foer, literary fiction, Michael Cunningham, Oskar, Room, The God of Small Things, Twin Towers by Emma Young. Bookmark the permalink. I love this Em, it makes me want to read it. Next week, when I am more brave. It really was amazing Mel!